We are there for you mile after mile. Arch Automotive is service repair shop servicing Audi and Volkswagen vehicles using state-of-the art diagnostic tools and technologies. Our highly talented Automotive Service Technicians have experience in independently performing skilled work in the repair, maintenance, service and adjustment of fleet of vehicles to include shuttle buses, autos, vans, trucks.With more than 40 years combined automotive experience the Mechanics at Arch Automotive have thorough knowledge of automotive equipment mechanics including electrical systems, brake and engine overhaul procedures.The Audi Service department at Arch Automotive is equipped to handle anything from routine maintenance to major repairs. Originally from Jamaica, Glen has made Cayman his home for over 15 years and has been a technician with Arch Automotive since he arrived. As a master technician, Glen is ASE certified and holds numerous other technical certifications and training with Audi & Volkswagen. He is passionate about his career and is our go to guy for alignments. His career in the automotive industry spans over two decades and he is inspired by the changes in technology and engineering in our field. Active in the community in training Cayman’s youth and volunteering at high school career days, Olando is newly married and is a career master technician with Arch Automotive. Olando has called Cayman home for over 8 years. His enthusiasm in the automotive industry is infectious with over 12 years of experience. 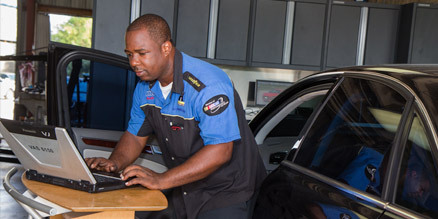 He specializes in Audi diagnostic service is ASE certified and has many additional certifications throughout the years from both Audi & Volkswagen ,including the entire line of models . He is an Audi Fanatic! While Ricky is the newest member of our career technicians, he has also become an integral part of our master technician team since starting with us in 2012. He is ASE certified, and with his determination and the love of a good challenge, strives for excellence in his electrical diagnosis of vehicles of all makes and models. With over 15 years of experience in the automotive industry, when Ricky is not under a vehicle, he enjoys the Cayman Islands’ beaches and enjoys exploring new places.